← The Crunchiest Dill Pickles Ever! Italian plums are at their peak of freshness in Southern Ontario. It’s a great time to buy a basket of plums and create some late summer memories for the cold Winter ahead. What better way to do this than make some Drunken Infused Plums In Vodka. I’ve done this before with cherries and it is always a crowd pleaser. I’m not sure what it is, but a lot of folks get excited about eating alcohol infused fruit. Maybe it’s because they can combine getting a bit lacquered with their daily recommended serving of fruit. “Louie……would you like an apple or banana with your lunch today?” “Neither Maria…….I’m going over to City Boy’s house tonight and gonna’ eat some Drunken Plums”. 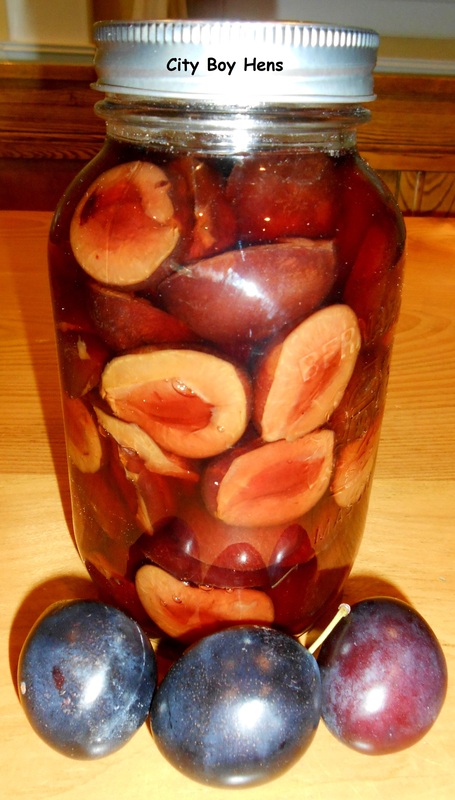 In order to make a really good vodka liqueur, it is necessary to cut the plums in half and remove the pit. This will allow the vodka to penetrate into the fruit much faster and allow the sugars from the plums to flavor the vodka. I promise that this liqueur is going to taste amazing! You won’t believe how sweet it becomes after a few months in those mason jars! 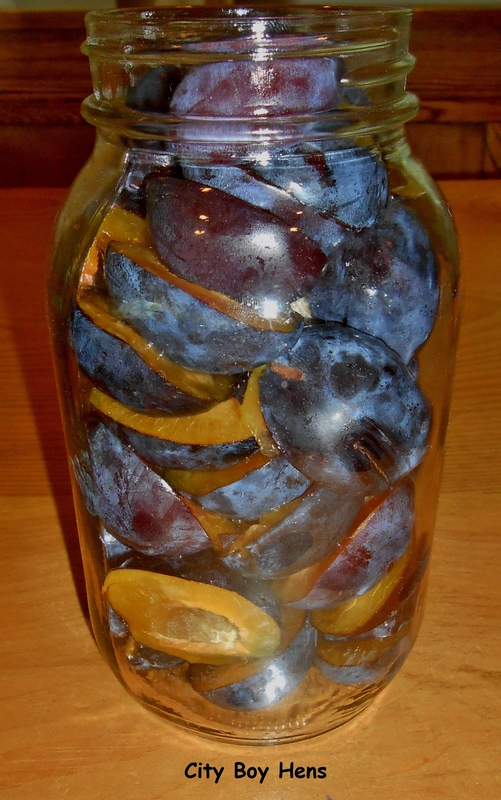 Using a canning funnel (just because it’s easier), drop your plums into a sterilized mason jar. Make sure to pack them in tight without breaking up the plums. You can sterilize the jar by placing it in the oven for 10 minutes at 225 degrees Fahrenheit. Fill the jar with vodka, leaving a 1/4″ headspace and seal up the jar. Now, put the jar aside in your cantina or cold cellar and wait for the vodka to turn a rich amber color. You’ve got to give those babies at least 3 months to flavor the vodka. But, don’t worry, they’ll be ready just in time for your Christmas or New Year’s celebrations! 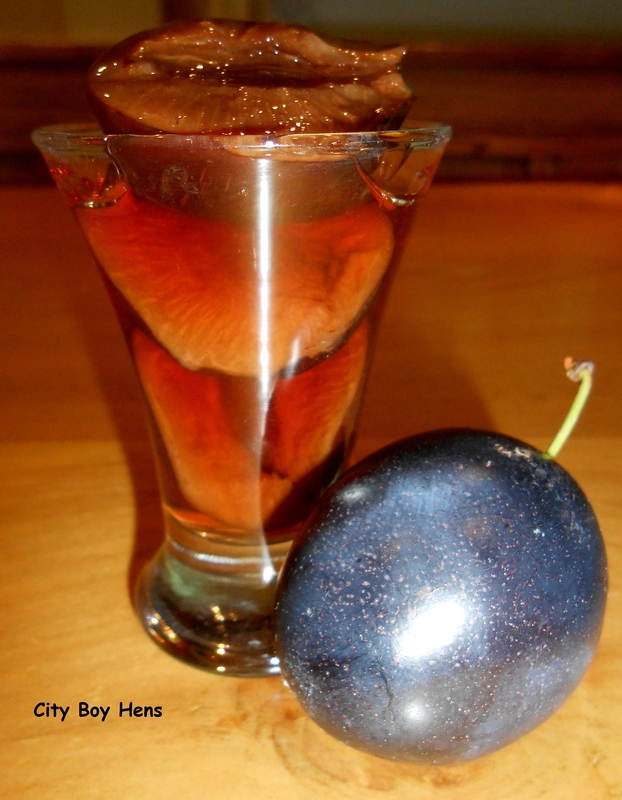 Serve 2-3 plumb halves in a liqueur glass with a toothpick. Your family & friends are going to love them! Enjoy responsibly! There’s a recipie for brandied peaches in The Big Blue Book (available where most canning goods are sold). There were always a big hit w/ my ex and his pals during football season. You can’t taste the brandy but those peaches are strong! Thanks for your comments. I’ll take a look in the book. What a great recipe! If you don’t have a cold cellar, can you refrigerate the flums while they infuse? Thanks! You can just use a cupboard in your kitchen. They do not need to be kept cool. 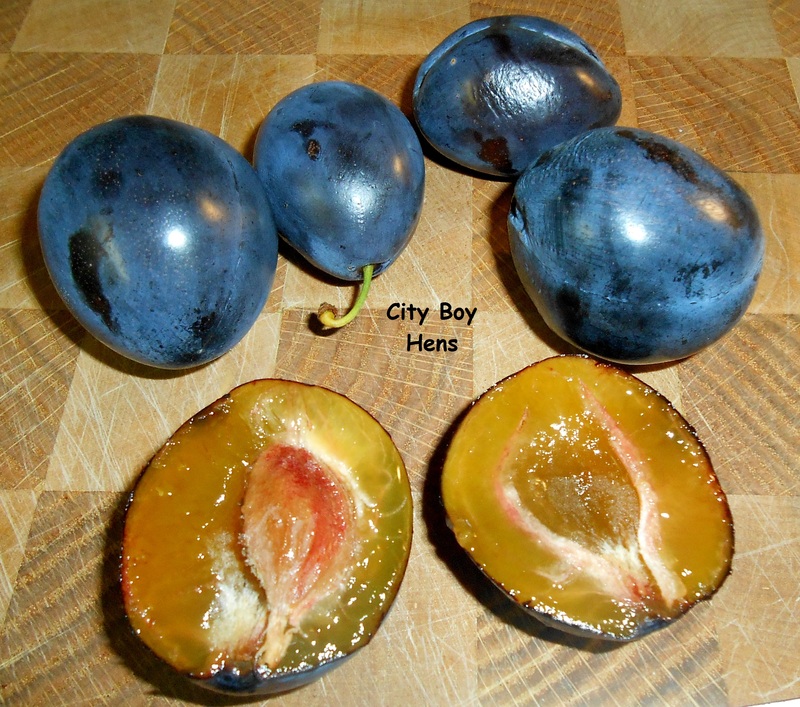 Plums, cherries…what next? I think your fruit may need to join a 12 step program! At least they can carpool together to the meetings. LOL! Thanks for linking up with the Clever Chicks Blog Hop! Who knew you could get drunk on plums? lol! Thanks for sharing with SYC. Lovely recipe, I have some plums and some vodka and in 4 months time it will be Christmas. Perfect thank you.